University of Michigan-Flint students Justin Adsitt-Weiner, Chloe’ Kas-Mikha, and Jennifer Wenzlick were selected as the School of Management’s Hagerman Student Scholars. Through this opportunity, Adsitt-Weiner, Kas-Mikha, and Wenzlick committed to being ambassadors for the new Hagerman Center for Innovation and Entrepreneurship and will get firsthand experience in working with the School of Management and its professors in order to build a network of professionals in the community. 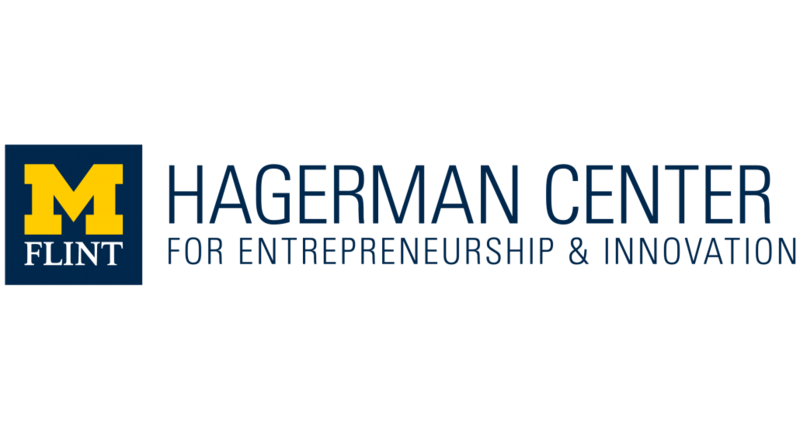 The Hagerman Student Scholars program was made possible by a gift by Phil and Jocelyn Hagerman to establish the Hagerman Center for Entrepreneurship and Innovation (HCEI). Justin Adsitt-Weiner, a sophomore majoring in international business, a former Business Plan Competition participant, cites the competition as motivation to apply for the Hagerman Student Scholar program. “Prior to the competition I had had limited exposure to what entrepreneurship looked like in practice, and it was the skills that I began developing for and through the competition along with the influence of faculty members such as Dr. Laurence and Dr. Witt that kindled my now burning excitement to incorporate an entrepreneurial mindset into whatever path I may take,” said Adsitt-Weiner. With the experience he gained through the Business Plan Competition and with the opportunities he was offered through the Hagerman Scholarship, Adsitt-Weiner understands the significant impact this can have on future recipients. “By directly providing students with the support that is needed, they will have both more time and opportunity to take part in additional collegiate activities. With the addition of the Hagerman Center for Entrepreneurship and Innovation, these opportunities are boundless in their potential to help students achieve whatever goals they may have,” said Adsitt-Weiner. Senior double majoring in health sciences and business marketing Chloe’ Kas-Mikha cites campus organizations such as Student Government, The Michigan Times, and Sigma Sigma Sigma Sorority as giving her the skills to be an ambassador for the Hagerman Center. Her involvement with the community has strengthened after receiving the Hagerman Scholarship. “I am thankful to the Hagerman’s for allowing the opportunity to apply for the scholarship and being a recipient of it. The Hagerman’s generosity has inspired me to continue to help others and give back to the community,” said Kas-Mikha. Kas-Mikha cites the Hagerman’s involvement as inspiration to continue her education and educating others.“ The Hagermans have aided in fostering education and growth at the University of Michigan-Flint and throughout the Flint community. I am happy to be a part of that change and legacy to teach and aid others,” said Kas-Mikha. Senior human resources major Jennifer Wenzlick hopes the Hagerman Scholarship will benefit the next round of recipients the same way it helped her. “It is inspiring and motivating to do more in community and to be more involved. I hope it gives them the same passion and drive that it has given me. I hope that it will follow through with the next recipients,” said Wenzlick. Wenzlick’s involvement with the community and School of Management events has increased since receiving the scholarship. Along with attending the Business Plan Competition last year, she is excited for what is to come in this year’s Business Plan Competition event. “I watched the final rounds last year and thought the Business Plan Competition was pretty cool. I am really excited to hear about the new ideas from inspiring entrepreneurs in our community. I still follow the companies from last year’s Business Plan Competition to see how they grow,” said Wenzlick.